Set amidst 300 acres of beautiful parkland, the calm, tranquil surroundings of Stirling Court Hotel allow you to hear yourself think. 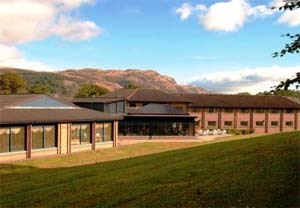 The hotel's unique links with the University of Stirling ensure that our guests are spoiled for choice when looking for ways to unwind or keep fit. With the National Swimming Academy’s 50m swimming pool, a state of the art fitness suite and 9-hole golf course all located within the spacious grounds of ‘the most picturesque university campus in Europe’, guests can exercise their body as well as their mind during their stay.For the less energetic, the MacRobert Arts Centre on campus provides a full programme of films, live theatre, concerts and exhibitions all year round. Stirling Court Hotel offers a ‘home from home’ in our 101 deluxe en-suite rooms -comprising of 91 Double Rooms, 5 Twin Rooms, 1 Suite and 4 accessible rooms. Superior service is always the top item on the agenda - morning , noon and night. Seating up to 230 diners, our light and airy Abbeycraig Restaurant is open for breakfast, lunch and dinner daily and can be booked for private functions. Breakfast and lunch are both mixed service meals, while waiter service is the order of the day for evening dinner. The Abbeycraig Restaurant is a no smoking area. 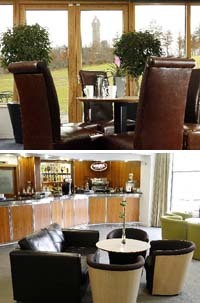 Relax and unwind in our comfortable lounge bar. In addition to a well stocked bar, you can also indulge yourself by choosing from the wide selection of special Costa coffees or a bite to eat from our extensive bar menu. The Adjoining Balcony area can be used for less formal events. Ideal for cocktails, malt whisky tastings, small displays or exhibitions, informal suppers or discussion groups. It is also possible to reserve this area for private functions. The Abbeycraig Lounge Bar is a no smoking area.